I have been an employee of DUDLEY COUNCIL for 30 years, working as an HOUSING Officer, Homeless Project Manager and currently in the Community Safety Team. 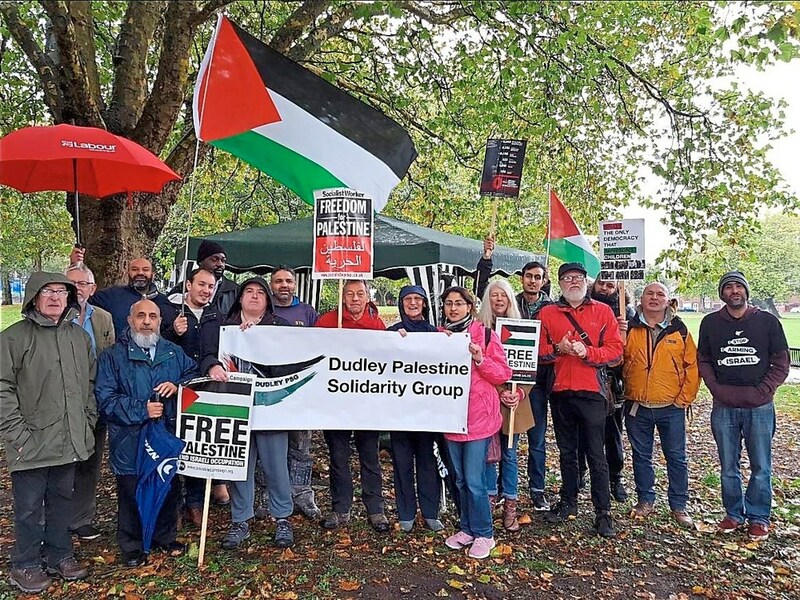 On 6 July 2018 the local DUDLEY Palestine Solidarity Group called a lobby of DUDLEY North MP Ian Austin’s Surgery because of a tweet he sent out – then deleted – stating “HAMAS and the Palestinians were responsible for the deaths of18 Gazans ” during the Great Return March in May 2018. At this lobby Austin twice asked “are you Paul Jonson who works for DUDLEY Council?”. My response – ” my day job is irrelevant so please dont try and intimidate me. I’m not here in any capacity regarding DMBC”. On 5th October 2018 I posted on Facebook “STAND WITH PALESTINE – STATE OF ISRAEL IS RACIST ENDEVOUR” – support the lobby at Buffery Park DUDLEY 6th October 2018 at11am. On the 18th October 2018 I was called to an urgent meeting with DMBCs HR and a Senior Manager stating they had received a complaint via the Campaign Against Anti Semitism . I was asked 22 questions relating to the IHRA. I was instructed to refrain from attending work until the Council had received further legal advice on the matter . On Wednesday 31st October 2018 I was called to a 2nd meeting – my UNISON rep was present – and advised I was suspended until further notice whilst further “legal advice”was sought. The matter is with UNISON Regional Office. Apparently DMBC adopted the IHRA 12 months ago -Staff were not advised or any briefings/training undertaken. To date some 130 local authorities have adopted the non legal IHRA .A document which out of 195 countries only 31 have adopted and only 7 with the controversial examples. Over 40 Jewish Groups have voiced their opposition to the examples , particularly – is criticism of Israel tantamount to anti semantism. The author of the IHRA Kenneth Stern has also withdrew his support stating ” it was not his intention for the IHRA to be used as a political tool to close down debate on Israel/Palestine’ but an Educative document regarding the Holocaust and to collect data on anti semitism. To cite Palestinian Solidarity action for Human Rights Justice and Equality to be in conflict with Employment Rights and to be anti Semitic in ìntent – is both unacceptable and an insult to the memory of all Holocaust victims. FOR THE IHRA TO BE USED IN THIS WAY MUST BE RESISTED ! There will be a Dudley PSC silent protest at another Ian Austin MP surgery at 5 pm Friday December 7, Dudley Library St James’ Road, Dudley, saying “Free Speech on Palestine”. Please go along if you can! The case of Paul Jonson is similar to that of LAW secretary Stan Keable, who was sacked from his job at Hammersmith & Fulham council. The witch hunt has clearly permeated all areas of society – most worryingly the workplace. This has serious financial consequences for our comrades, which is why we hope you will speak out and pass this motion against the sacking of Stan Keable in your Labour and union branches. Strongly condemns the suspension of Paul Jonson by his employer, Dudley Council. Paul is a longstanding anti-racist activist and campaigner against fascism and antisemitism. Paul’s suspension for a facebook post stating “Stand up for Palestine – Israel is a racist endeavor” constitutes an overt attack on trade unionists right to engage in political campaigning outside work and the right to free expression of political views. His suspension constitutes an attack on trade unionists’ right to campaign over Palestinian rights. There is nothing antisemitic about the posting cited in the complaints about Paul. We note that the IHRA definition of antisemitism and its illustrative examples cited in complaints against Paul, is highly controversial and according to the IHRA itself constitutes simply a “working definition” with no legal standing. We believe Paul’s suspension poses a threat to every trade unionist right to campaign over human rights in general and Palestinian rights in particular. We demand the lifting of Paul Johnson’s suspension and his immediate reinstatement.